Mirroring is a way of scaling a download site, so the download load can be spread across many servers in many parts of the world. 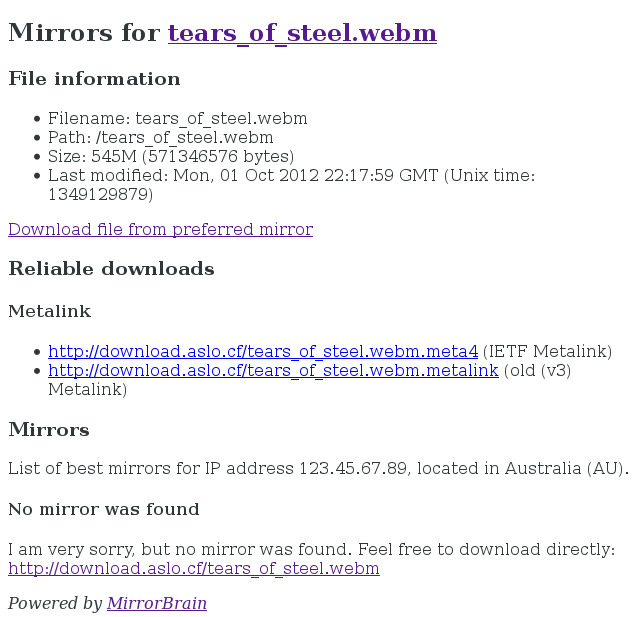 Mirrors host copies of the files and are managed by a mirror director. A mirror director is the center of any mirror system. It is responsible for directing traffic to the closest appropriate mirror so users can download more quickly. Mirroring is a unique system with its own advantages and disadvantages. Unlike a DNS based system, mirroring is more much more flexible. There is no need to wait for DNS or even to trust the mirroring server (the mirror director can scan the mirror to check its validity and completeness). This is one reason many open source projects use mirrors to harness the generosity of ISPs and server owners to take the load off the open source project's own servers for downloads. Unfortunately, a mirroring system will increase the overhead of any HTTP request, as the request must travel to the mirror director before being redirected to the real file. Therefore, mirroring is commonly used for hosting downloads (single large files), but is not recommended for websites (many small files). This article will show you how to set up a MirrorBrain instance (a popular, feature-rich mirror director) and an rsync server (rsync lets mirrors sync files with the director) on one server. Then we will set up one mirror on a different server. Two Ubuntu 14.04 servers in different regions; one director and at least one mirror. First we need to compile and install MirrorBrain. The entire first part of this tutorial should be done on the mirror director server. We'll let you know when to switch to the mirror. Close and save the file (Ctrl-x, then y, then Enter). The geoip module may already be enabled; that's fine. Use Perl to install some more dependencies. Pay attention to the questions asked here. You should be able to press Enter or say y to accept the defaults. If you get warnings or errors, you may want to run through the configuration again by executing the perl -MCPAN -e 'install Bundle::LWP' command again. createlang: language "plpgsql" is already installed in database "mirrorbrain"
Now let's quit the PostgreSQL shell (Ctrl-D). When prompted, enter the password we set earlier for the mirrorbrain database user. You have now installed MirrorBrain and set up a database! You can also just upload new files as you would any other files; for example, by using SSHFS or SFTP. comment = My Mirror Director with Very Fast Download Speed! You should see a list of your files. DBDParams "host=localhost user=mirrorbrain password=database password dbname=mirrorbrain connect_timeout=15"
MirrorBrainMinSize Sets the minimum size file (in bytes) to be redirected to a mirror to download. This prevents MirrorBrain for redirecting people to download really small files, where the time taken to run the database lookup, GeoIP, etc. is longer than to just serve the file. MirrorBrainExcludeMimeType Sets which mime types should not be served from a mirror. Consider enabling this for key files or similar; small files that must be delivered 100% accurately. Use this option multiple times in your configuration file to enable it for multiple mime types. MirrorBrainExcludeUserAgent This option stops redirects for a given user agent. Some clients (e.g. curl) require special configuration to work with redirects, and it may be easier to just serve the files directly to those users. You can use wildcards (e.g. *Chrome/* will disable redirection for any Chrome user). A full list of configuration options can be found on the MirrorBrain website. Congratulations, you now have MirrorBrain up and running! If you have very quickly changing content, it would be wise to add more scan often, e.g., 0,30 * * * * for every half an hour. If you have a very powerful server, you could increase the number of --jobs to scan more mirrors at the same time. Now that we have a mirror director set up, let's create our first mirror. You can follow this section for every mirror you want to add. For this section, use a different Ubuntu 14.04 server, preferably in a different region. rsync -avzh rsync://download.example.org/main /var/www/download.example.org --exclude "movies/old" --exclude "songs/old"
Now we need to publish our mirror over HTTP (for users) and over rsync (for MirrorBrain scanning). Step Two section and run perl -MCPAN -e 'install Bundle::LWP' again. Assuming the scan is successful (MirrorBrain can connect to the server), the mirror will be added to the database. Now try going to the MirrorBrain instance on the director server (e.g., download.example.org - not london1.download.example.org). Again, click on a file, and append ".mirrorlist" to the end of the URL. You should now see the new mirror listed under the available mirrors section. You can add more mirrors with your own servers in other places in the world, or you can use mb new to add a mirror that somebody else is running for you. Re-enable the mirror using the mb scan --enable london1.download.example.org command as used above.